The soldiers of the Venezuelan Army stood firm and prevented the truck and its accompanying Guado supporters from crossing the bridge (except for three who had commandeered an armoured car and had recklessly driven that armoured car into a crowd of soldiers and civilians who were defending the border, injuring at least one female civilian). Whether or not those initial trucks contained weapons, it would have set a dangerous precedent to have allowed them to freely travel into territories controlled by the Venezuelan opposition. Had the first trucks crossed the border, this would have almost certainly led to many more trucks and trucks containing weapons concealed beneath supposed humanitarian aid. Elliott Abrams, (United States Special Representative for Venezuela) currently advising the United States attempted coup, previously served prison time for smuggling weapons in humanitarian aid vehicles to Nicaragua in 1986. A repetition of such weapons-smuggling into Venezuela in the coming days would make a bloody civil war inevitable. 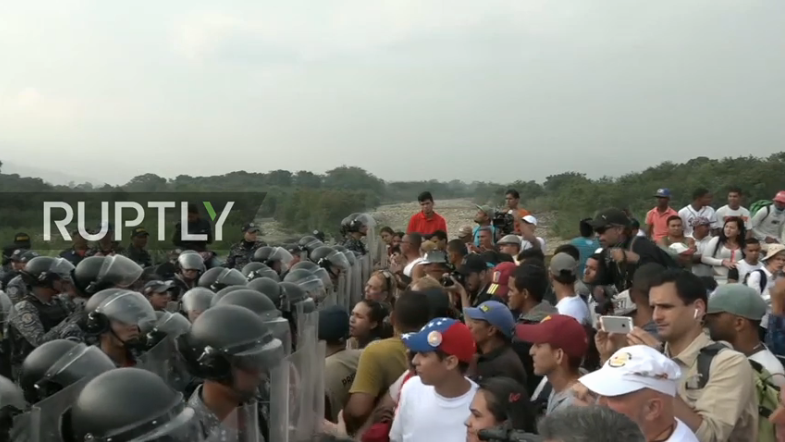 Following this failed attempt, a threatening crowd of Guaido supporters stood against the line of Venezuelan soldiers variously shouting at them, trying to persuade them to desert or, failing that, aiming to intimidate them by repeatedly filming or photographing them at close range. (As shown in the above illustration, snapped from the live Ruptly video stream). The clear implication was that those soldiers, who defended the border on that day, would be identified and subsequently made to suffer repercussions, should they and their U.S. government controllers ever succeed in overthrowing President Maduro.